Arsenal vs. Chelsea : 27 December 2010. Our last game – it seems ages ago, doesn’t it? – was at White Hart Lane and we now found ourselves heading for The Emirates. I’m sure it has happened before, but I certainly can’t remember two consecutive away games at our traditional London rivals. From the urban blight of Tottenham’s stadium to the swanky lines of Arsenal’s new pad, a distance of no more than a few miles, but with fifteen days in between. Fifteen days of sporting inactivity. Fifteen days of anticipation – and doubt. I have been suffering with a heavy cold, with associated coughing and wheezing, for much of the past week. Thankfully, I awoke feeling much better and I was able to look forward to the day ahead with a more positive angle. The fields around my village have been coated in snow for quite a while, but I noted a slight thaw taking place in the morning. By comparison to the previously arctic conditions, the temperature outside seemed positively tropical. I was happy that our game against Arsenal was put back 24 hours as it gave me one more day to continue my recuperation. The coughing had subsided…I would be OK. I gathered together my various match day essentials – coat, cap, phone, wallet and camera – and stepped outside into the bright winter sun. As I turned the ignition of my car, the bells of Saint Andrews parish church struck one. In the distance, the muffled sounds of a local shoot could be heard. The village is set amongst countryside owned by various farmers – to say nothing of our very own landed gentry, the Earl of Oxford and Asquith. Dairy farming is to the fore, but arable crops are often rotated around too. During the winter, the local farmers supplement their incomes by hosting events as pheasant shoots and suchlike. It was the crack of a rifle that I could hear a mile or so away. During the morning, I had driven past a heavily camouflaged team of “beaters”, crouching near a hedge, waiting for the next instruction from the leading hand. There is something quite laughable about the clothes worn by these hunting types – all checked shirts, tartan ties, flat caps, muted green and beige tweed jackets and britches, outlandish mustard cord trousers, Barbour jackets and Daks pullovers. They really are a picture of upper-middle class buffoonery. I always smile when I see them. Without a doubt, they are a rare breed. And yet – in case anyone is wondering why I am mentioning all this, in addition to setting the scene for my wintry foray through England’s green ( and white ) pleasant land – there are a couple of items which are favoured by the hunting set which have been adopted by the football fraternity over the years. Back during the early onset of football fashion madness, circa 1981 maybe, deer-stalker hats were worn with drainpipe jeans and the leisure wear of the day. I can certainly remember dear-stalkers on show on The Benches in 1983, but they soon disappeared from view. I saw one, being worn with ironic gusto, at a European away a few years back. And then, of course, the Barbour wax jacket, with the oily feel to the fabric and its inherently pungent aroma. These were worn around the 1986-1988 period and I contemplated getting one for a few short weeks. Barbour has come back into football circles over the past few years and a few of us have the classic quilted jackets, polo shirts, long-sleeved shirts and pullovers. Proper English gear – as worn by the middle-classes in The Shires and football followers on the terraces. As I left the village, Texas were on the CD singing about “some foolish mission” and I rued their words. This would be a tough game for sure. Despite their defensive frailties, Arsenal represented one of our toughest opponents this season. This would be a solo trip up to London for me. It felt strange to be heading east all alone. Both Parky and Glenn, season ticket-holders, were keen to go to Arsenal, but had missed out. Arsenal away is a tough ticket. Despite 60,000 spectators at Arsenal, any away team is limited to a maximum 3,000 tickets. There are around 500 in the away scheme and the rest goes 60% / 40% to season ticket-holders and members. Parky missed out on an away trip to Goonerville by one solitary loyalty point and was mortified. I raced over Salisbury Plain, the fields still white with snow, and was soon stopping for an espresso on the A303. Onto the M25, the traffic slowed to a crawl and gave me the chance to observe the westbound planes leaving Heathrow, now getting back to normality after our unusual wintry spell. The Killers gave way to the Cocteau Twins as I neared my destination. I enjoyed listening to the two atypical Cocteaus songs “Winter Wonderland” and “Frosty The Snowman” – never have the words to those Christmas songs sounded so ethereal and shimmery. I was parked-up near West Brompton and walked to Earls Court, before catching the Piccadilly Line to Holborn. We had arranged to meet, as always for Arsenal, at The Shakespeare’s Head. I rolled in, a little late, at about 4.30pm. The Americans were there – Rick and Becky from Ohio, and Paul and Mary-Ann from Tennessee – and it was lovely to see them. I first met Rick in that cramped wedge of Chelsea support at Toyota Park in Chicago in 2006. I met Paul and Mary Anne at “Yankee Doodles” in Santa Monica in 2007. Great to see them again – they had just arrived in London and were all staying in the hotel at The Bridge. Paul and Mary Anne had already packed in a Boxing Day excursion to Stonehenge, Glastonbury and Avebury…a mystical mystery tour of Wessex. They should have popped in for a coffee as they must have passed very close to my own little part of England. We joined Daryl, Rob, Alan and Gary further inside the boozer. 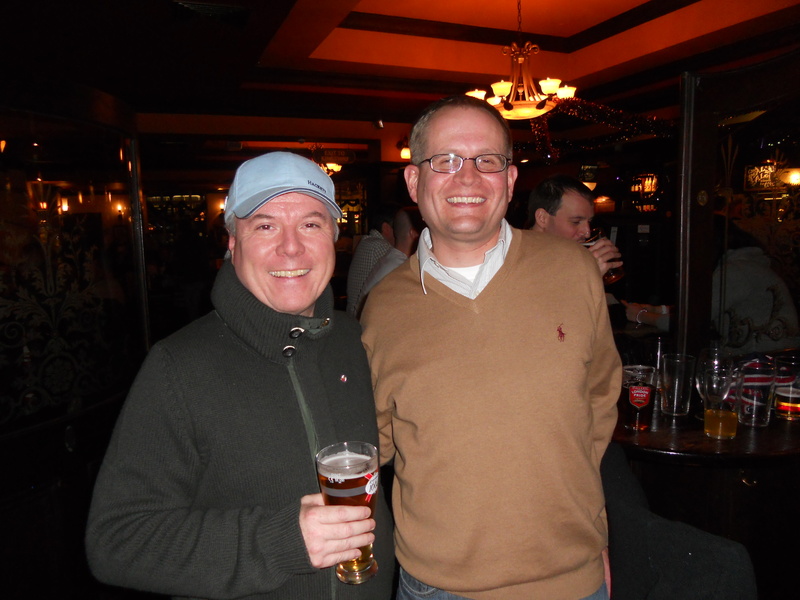 We stayed in the pub for around two-and-a-half hours and we were joined by Kev, now back in Michigan, at about 5.30pm. Kev had been on his own little tour of England, visiting friends and family alike. The pub was busy – there were clusters of middle-aged Chelsea fans everywhere I could look. We spoke about what? All sorts, really…Paul’s bright orange Tennessee Volunteers sweatshirt, the idiosyncrasies of English TV, the Amish, scrumpy, mutual friends, plastic surgery for Kev,plans for Wednesday, my new CP pullover (a deep, muted green – very “Shooting Party”! ), past summer tours, Detroit Bob’s beer intake… even the team occasionally. Mary Anne, ever the CIA cheerleader, quickly placed a CIA calling card in his hand and we wished him a good time. He was from Dallas and it is hoped that this friendly encounter deep below the cold streets of Holloway will result in another member, or two, for the Texas Blues. As we marched through the narrow tunnels at Arsenal tube, a few Chelsea up ahead began The Muppets-inspired “Ivanovic – Na Na, Na NaNa – Ivanovic – Na NaNaNa” chant. It was great to hear – and I could see that Jim the Texan loved it. One lone Arsenal fan, no older than ten, was trying to muster a response with a shrill “Red Army” offering. At street level, we turned left and not right. I had promised my five guests a quick glimpse at the old Arsenal stadium, Highbury, now a housing development but with the two classic Art Deco side stands intact. It was the first time I had paid it a visit since the move to The Emirates to be honest. We took a few photos out on Avenell Road, the Arsenal Stadium signage still intact. We then sat on the steps leading up to the famous marble halls and took a few photos, Becky’s Chelsea scarf unfurled for effect. I had immediate memories of the 1984 game – detailed in depth in “Chelsea Here Chelsea There” – and of the smiling Chelsea players giving us the “thumbs-up” from the large windows of the changing rooms as we marched past. What a day that was – ah, the memories. We backtracked past the tube station, joining the flow of match traffic heading west, past the Arsenal souvenir stalls, past the hot dog stands, past the T-shirts. To my left, one other stall caught my attention. A candy-striped awning covered box upon box of assorted confectionary. There must have been forty or fifty boxes, filled with various items such as liquorice sticks, boiled fruit sweets, peanut brittle, toffees, mint imperials, fudge, candy walking sticks, chocolate covered nuts, peppermint creams, chocolate raisins, flying saucers, wine gums and pastilles. It was quite a picture. Sweets of every shape and size.Sweets of every colour.Sweets of every hue. Quite tempting in fact. The Arsenal manager Arsene Wenger was not available for comment. We walked, slowly – taking it all in – up and over the footbridge which links the old Arsenal of the narrow terraced streets around Highbury with the 21st Century space-age Emirates Stadium. I squeezed both Paul and Mary Anne’s hands – “Welcome To London” – and I could sense that they were besides themselves with excitement. I’m lucky to be able to be able to share these moments of unbridled joy with so many new visitors to these footballing shores. I reached my seats in that corner section with a few minutes to spare. The Emirates – my fifth visit – and, of course, rich with memories already. We lost the hold on our champions crown at the 1-1 game in 2007, when Jose Mourinho made that iconic walk towards us, thanking us for our support, the famous “chin up” gesture to us all. To me, that was a defining Chelsea moment – it reminded me that even in defeat, we could be defiant, belligerent, noisy, passionate and united. But then, the game before Christmas the same year under the tutelage of Uncle Avram was a grim affair…a 0-1 loss and were never in it. Since then, the 2009 games – the 4-1 and the 3-0 goal fests – were just too good to be true…two magnificent results and the old phrase “men against boys” was never more apt. What of the game of Monday 27th. December 2010? It was all doom and gloom at half-time in the CFC section. We hadn’t threatened, had we? Kalou was in for the usual slating, but nobody shone, JT excepted. I couldn’t quite fathom why Mikel was taken off as the underperforming Ramires took his place. I yearned for a “Spurs Away Part Two” in that second forty-five minutes. Our game plan fell apart within a few crazy minutes – first Essien losing possession and Fabregas slotting home, then Malouda guilty of the same and Walcott rifling home from distance. This made the home fans erupt and the sight of their flailing arms is haunting me as I write. At this stage, I had visions of a capitulation and our heaviest league defeat since a 5-1 drubbing at Anfield in 1996. Thank heavens that didn’t happen – I’m searching for small morsels of positive news here – and at least the Chelsea support stayed to support the team. There was no mass exodus at three-nil. We were rewarded with a fine Ivanovic header from a pin-point Drogba free-kick. We temporarily roared our support and hoped that the wounded beast would respond. It shows what a deeply pathetic romantic soul that I am that I still had hopes for us to get it back to 3-3. I’d suggest that JT was our only player who showed any drive and skill, yet – bizarrely – all three Arsenal goals came through our middle. We tried to rally the troops – despite a recent sore throat, I gave my all. We had possession, for sure, but no threat. No threat at all. Bosingwa and Kakuta entered the fray – and Kalou stayed on. But Arsenal could sit back and soak it up, then threaten us at will on the break. I think I was just grateful that we didn’t concede further and it stayed 3-1. Arsenal made a few late substitutions and it reminded me of how little attention I had been paying to their personnel. I was only vaguely aware of who was in their team. I don’t pay such scant regard to other teams, so why am I so ambivalent as to who plays for Wenger? I think that this has been the way with Arsenal for the past few years. I think I lost any interest in Arsenal’s players when people like Hleb and Flamini flitted in and out of the team. They might still be there for all that I care. Is there a Clichy that still plays for them? I really don’t know and do you think I care? If I am honest, it just seems to me that Wenger has a whole squad of interchangeable waiflike metrosexuals and to hell with the lot of them.You see, rather than berate our own players – they need our support in these troubled times – I would much rather kick-out at the opposition. The Emirates, for large periods, remained incredibly quiet. It seems that some things, Highbury or not, don’t change. Regrettably, with a long drive ahead of me, I left on 90 minutes and so didn’t witness the final few moments of this most depressing night in North London. At Earls Court, feeling famished, I couldn’t resist popping into “Dall’Artista” for a fiery pizza which certainly put an end to the final vestiges of my head cold. Salvo rewarded me for another year of patronage of his restaurant with it being “on the house” and so there was at least some comfort in my solo trip to London. I got home, the thaw almost complete, the roads now ice-free, at about 1am. I collapsed onto my bed and hoped for a deep sleep, but I knew that when I eventually woke, the pain would still be there. Where is it all going wrong? I don’t know, but maybe we will find out more against Bolton. This entry was posted in Season 2010-2011. and tagged 2010-2011, Arsenal, Casuals, Chelsea In America, London Football, Pubs by Chris Axon. Bookmark the permalink.